The launch of Keren Dobia’s first solo exhibition last year capped off a meteoric rise for the Melbourne-based portrait photographer. She shares why creativity, in all its wonderful forms, is at the heart of her work. They say home is where the heart is, and so too for most portrait photographers. The origin of what they do often seems to start in the exact same place. After all, the best photography comes from shooting what we love, and what more do we love than our own family? "The Taxidermist" - Ashlee Duggan. When searching for a taxidermist for this series I was looking for the inconventional. Ash fit that bill and was so welcoming to the portrait idea we jumped into planning a shoot. This image took a full day of moving around props to create the final image. We battled for hours with the streaming in and out of the windows, and decided to wait until dusk to get the perfect light balance between flash and constant light. So it is probably no surprise that professional portrait photographer Keren Dobia’s first exposure to photography came from a family member, and her first subjects were the people she lived with in her family home. Behind the scenes of The Taxidermist. On discovering that her school also had a darkroom, she convinced her art teacher to show her the basics and quickly learned the fundamentals of chemicals and processing. Already she knew portraiture was what she liked shooting, and lucky for her, the subjects were everywhere. She enrolled in fashion school. Working towards a degree in fashion design would become her focus for the next two years. 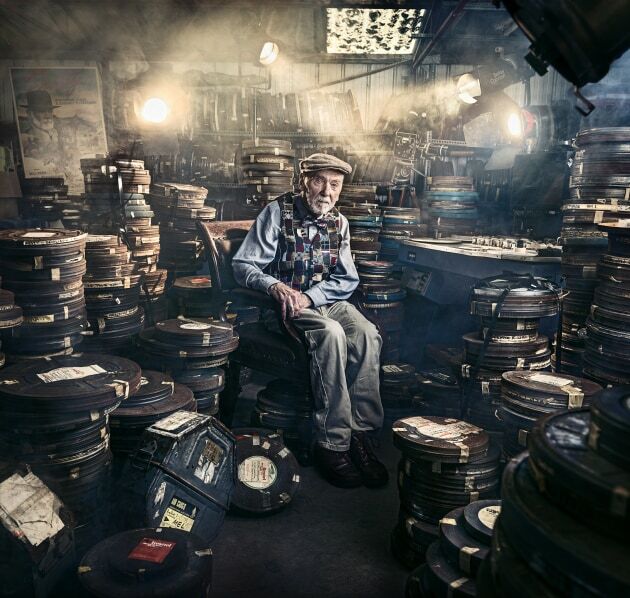 “The Filmmaker”, a portrait of Australian filmmaker John Richardson in his garage in Melbourne, Australia. I almost cancelled this photoshoot as John fell the morning of the shoot. He insisted we do the shoot and would get checked out by the doctor afterwards. After spending more then half the day moving rusty film canisters around the space and getting the lighting just right, we brought in the smoke machine and started shooting. 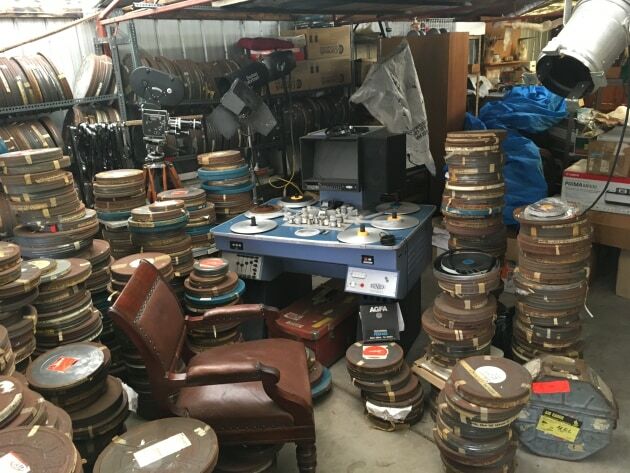 This is less then 1/3 of the total output of films created during his time spent in film production! Nikon D800, Nikon 24-70mm F/2.8 lens. 1/50s @ f5.6, ISO 100. However she soon realised something was missing. Although she loved fashion, she found herself enjoying the process of photographing the clothes much more than making them. Deciding to spend a year off before committing herself fully, she found a job in the most unlikely of places—photographing families with Father Christmas at the local mall. Behind the scenes of The Filmmaker. “I had to dress up as an elf and everything!” She laughs. Fortuitously the owner of the photography business also ran the local mini-lab, so she was able to learn colour management and printing on the side. Three months after she started, the manager quit and before she did she showed her the basics of Photoshop. Fast forward a year and with her grounding set, she now knew for certain what she wanted to do—a photography diploma at Melbourne Polytechnic, formally NMIT. 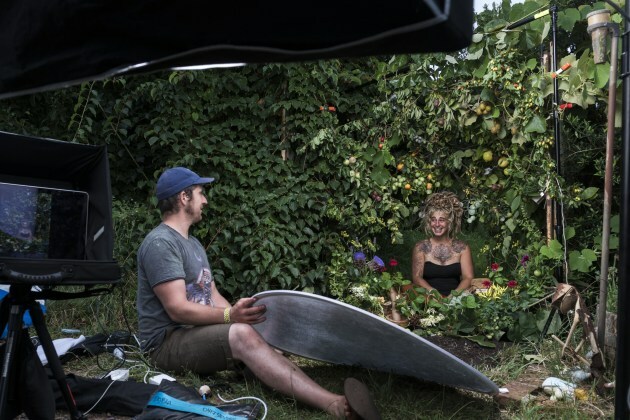 She graduated and worked as an assistant to wedding, food and lifestyle photographers, slowly building her reputation and name as a portrait specialist. 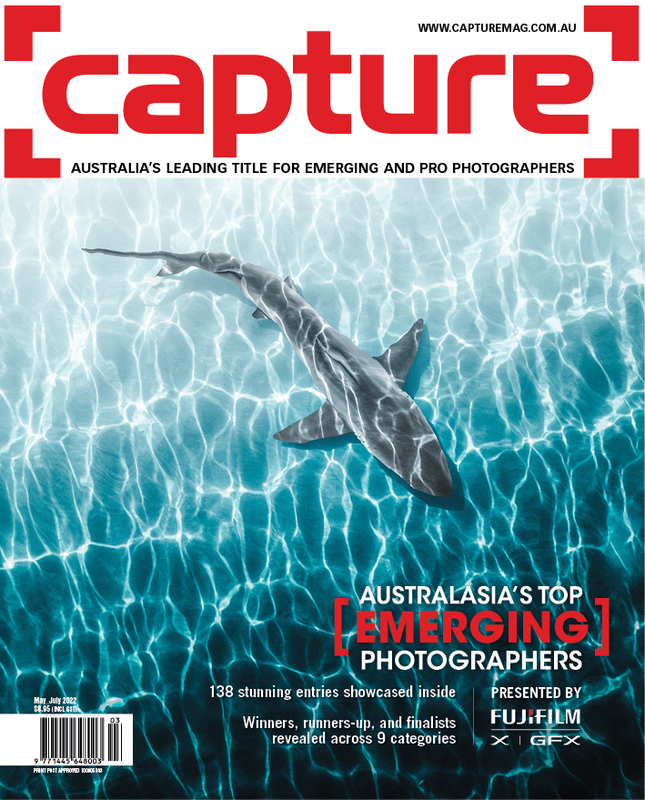 For many photographers, finding their niche is something they could spend a lifetime doing and it’s something she has become more aware of since becoming a lecturer at Melbourne Polytechnic and RMIT in the Photo imaging diploma courses at both institutions. For Dobia it was a little more clear cut. She says she always struggled to photograph static objects like products or landscapes. “Being a really social person I’ve always felt most comfortable shooting people,” she says. But just like most photographers, her work has evolved. She says she started by looking for interesting people to shoot, and simply putting them on a plain background, but then found she loved styling both them and the set. She continues to get excited when rummaging in op shops or when picking up recycling by the side of the road with visions of how these treasures may be used in a shoot. 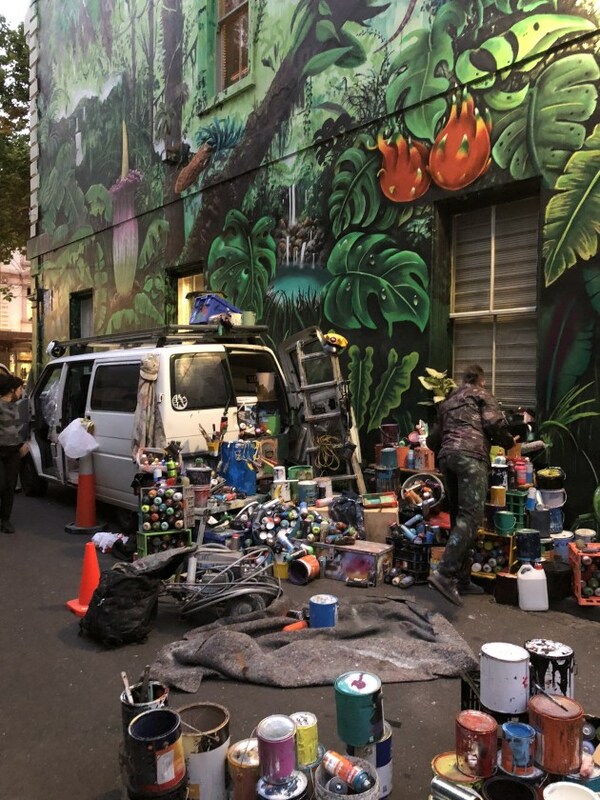 “The Muralist”, Australian artist Mike Makatron in front of his mural on Meyers place, Melbourne. 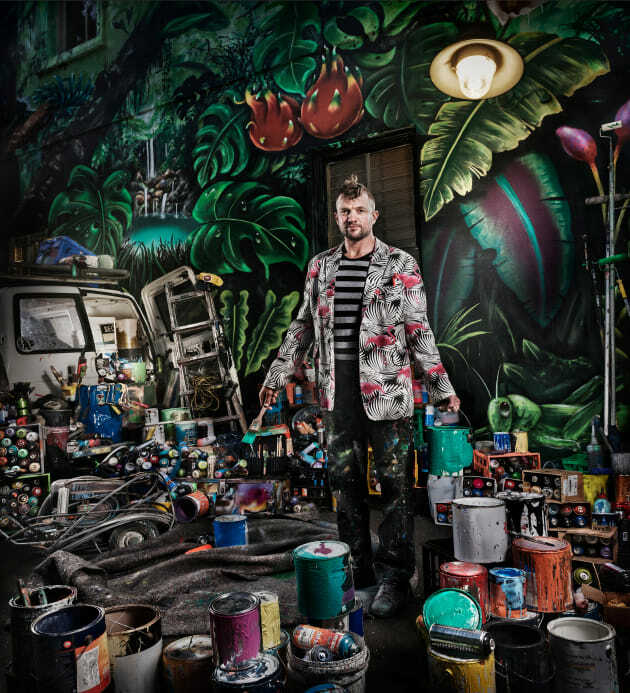 Mike is an Australian street artist who’s work graces the walls of public spaces throughout Australia and the world. I had noticed his work around Collingwood/Brunswick for some time. While I was hoping, I was not entirely convinced he would be available as he’s very busy. To my delight he enthusiastically agreed. 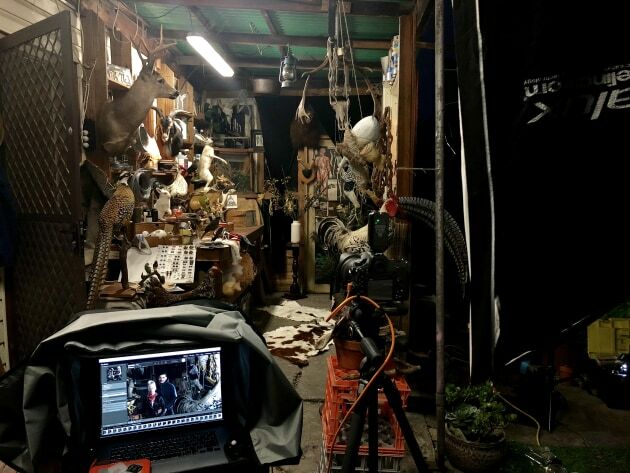 I wanted to show the scale of his work, the locations his work is often found and how much work it takes to create such large pieces, while also giving a little bit of quirk (Mike’s pink flamingo jacket, made by Heidi Chaloupka, was a no brainer). Nikon D800, Nikon 24-70mm f/2.8 lens. 1/40s @ f8, ISO 800. It’s been said the secret to great portraiture is when an image tells us something about our subject. Sometimes this is done best by showing little, and yet sometimes it works just as well by showing the viewer more—a lot more. Keren Dobia’s photographic style is very much the latter. Think of it as a sort of ‘Where’s Wally’ approach. Behind the scenes of The Muralist. Describing her photography now, three words come to her mind. “More is more”, she laughs. Her images are cinematic, colourful and dramatic, and have also become increasingly complex. But complexity for complexity’s sake rarely works on its own, and the level of planning in the images is testament to having a strong vision. 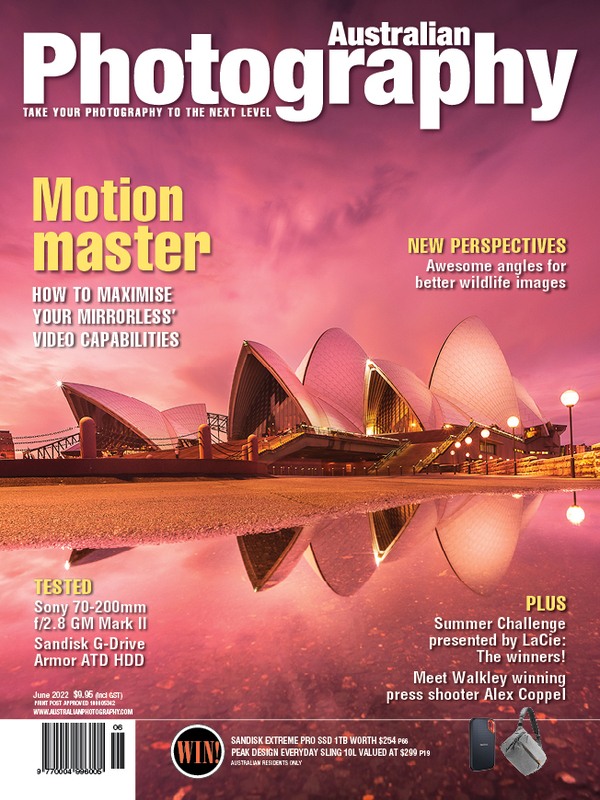 For a start, great photographs also come from being able to draw the viewer’s eye to a clear focal point in an image. Before anything is captured in camera there’s a ton of planning, initially with concept sketches to help develop a theme, but also to define what to include and exclude in the frame. The planning gives an indication of the gear and number of assistants that will be needed on set too. But more importantly her focus is getting it right in camera. While she has exceptional post production skills, she feels an image that starts out perfectly lit, styled and considered always lends itself to better quality post production and polishing options. Working collaboratively with the subject is very rewarding and ensures important aspects of their story are also included. The entire process from start to finish can take as long as two months for a single image. After a number of years of hard graft and refinement of what she does, she now has the freedom to create her own self-commissioned work. And with this freedom has come considerable recognition. Part of this recognition has developed from her involvement with the Australian Institute of Professional Photography, the AIPP, and it was through the institute that the seeds of her I AM exhibition series of portraits were sown. “The Fashion Designer”, a portrait of Australian fashion and textile designer Nixi Killick in her Richmond studio, Melbourne. This is Nixi Killick, ‘Rainbow warrior’. 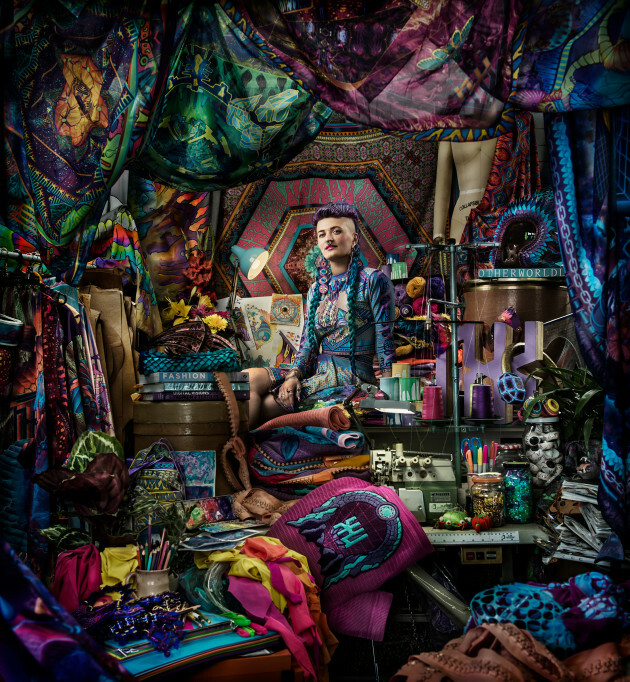 She designs psychedelic textiles, prints, wearable art and clothing. I loved creating and shooting this portrait. Both of us being “more is more” personality types allowed for us to connect and create this epic scene. Nikon D800, 1/25s @ f7.1, ISO 100. 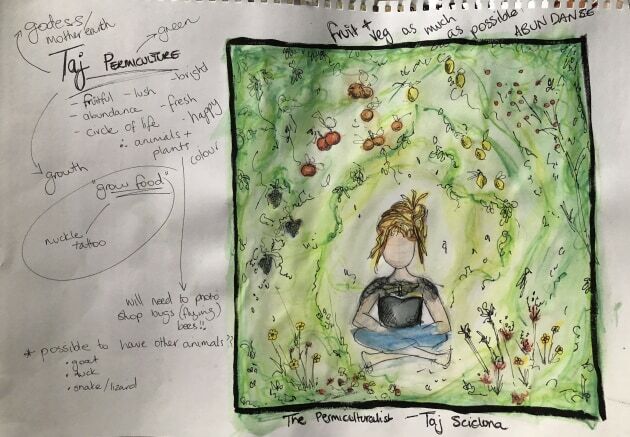 “The Permaculturalist”, a portrait of Australian Permaculture Designer Taj Scicluna in Silvan, Victoria, Australia, and some of the planning behind the shot. My partner had gone to checkout Taj’s new place in Silvan and was quickly on the phone to me. “Kez, all the trees are fruiting! If you want to do this shoot you need to do it now or wait a whole year!” We shot this two days later in January 2017. It took us almost the whole day to walk around the property selecting the “perfect” fruiting branches to set the scene. Meters of fishing line, many hidden clamps and booms later, we had a cave of edible abundance! If you look closely you’ll spot some of the animal life hidden through the scene, including a little black and yellow duckling. Nikon D800, Nikon 24-70mm F/2.8 lens. 1/40s @ f8, ISO 400. With the shoot under her belt, she realised that photographing fellow creatives left her inspired. She began seeking out people with a creative leaning who might want to be photographed for the series. 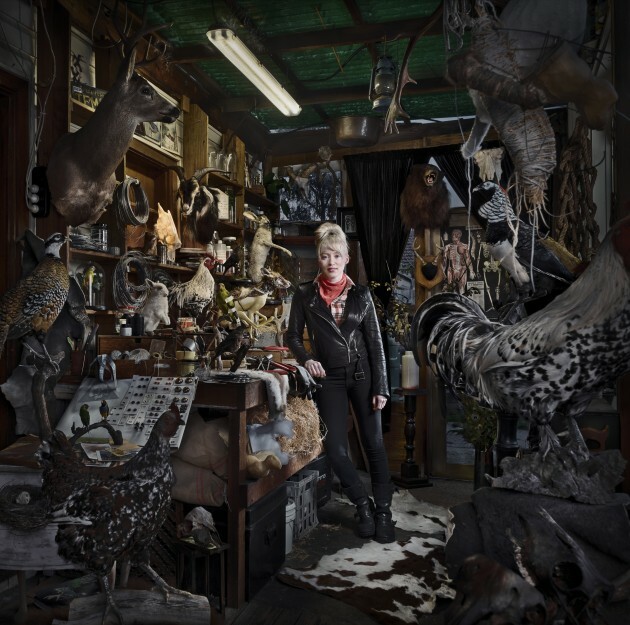 It was her success in winning the 2017 Australian Professional Photographer of the Year with images from her I AM series that has also spurred her on to continue the body of work. As in any small community, one subject would lead to another, and then another, and before she knew it she had photographed artists, a permaculturist, a taxidermist, a leather tanner, a filmmaker and more. Some 18 months later, the resulting images all reveal something unique about each subject and were the subject of her first exhibition, I AM, which opened last year. You can see more of Keren Dobia's work at kerendobia.com.au.